An imposing totem pole in downtown Jasper. 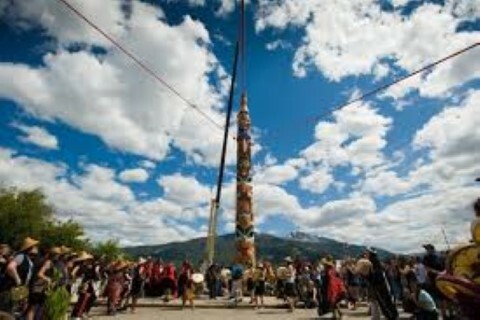 On Saturday, July 16th, 2011 as part of Parks Day and Parks Canada Centennial Celebrations, Jasper National Park along with many Aboriginal and non-Aboriginal partners pulled together to raise the Two Brothers Totem Pole in Jasper. To honour the event, Parks Canada also published The Two Brothers – A Haida Story. The book is illustrated by carvers Jaalen and Gwaai Edenshaw, and tells the Haida story behind the Two Brothers Totem Pole. The story of the Two Brothers was told to Jaalen and Gwaai by their grandmother Diane Brown. 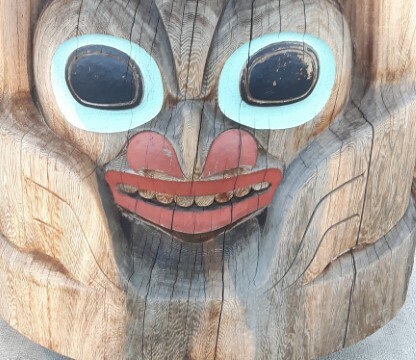 Both the book and the totem pole tell the story of two Haida brothers who, out of curiosity and a spirit of adventure, travelled long ago from Haida Gwaii to the Rocky Mountains. The book is being published in Haida, English and French.